I’m not embarrassed to admit I love a good bargain. I think as someone who was raised humbly, without any excess, I learned to value the dollar from an early age, and it’s always stuck with me. That’s one reason I’ve always been a fan of Overstock. They have so many styles and products to choose from all at unbelievably affordable prices. When Overstock reached out to me about a potential partnership, I was psyched. They asked me to head to Salt Lake City for a design challenge (more on that later!) as part of their #OverstockStyle Weekend, but I wasn’t aware that their team also had a major surprise planned. 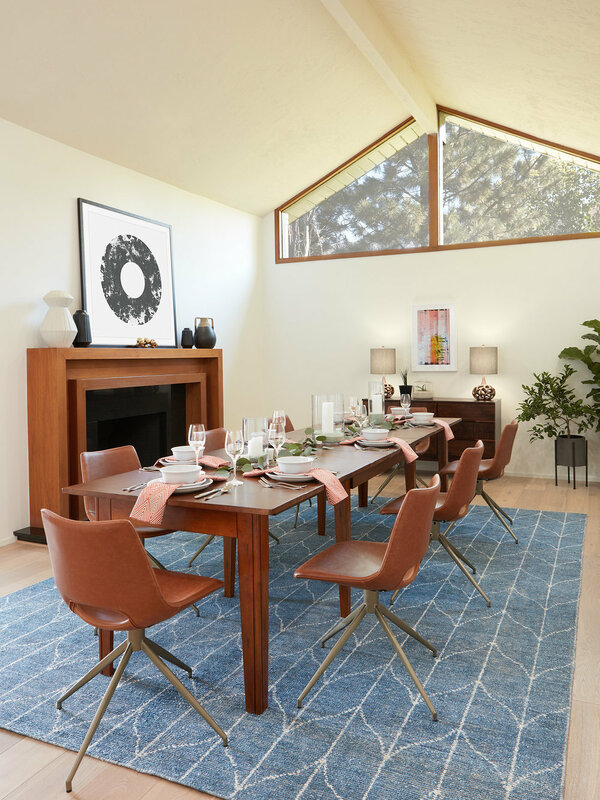 Coco Kelley’s Cassandra LaValle, Little Green Notebook’s Jenny Komenda, Simply Grove’s Kirsten Grove, At Home With Ashley’s Ashley Wilson, and myself were all brought to an amazing home in the hills where we were stunned to find rooms inspired by each of our specific aesthetics. So sneaky of them but also it was the sweetest and best surprise. All of the rooms were so perfectly tailored to the given influencer, but of course I was extra in love with mine! For the living room inspired by me, they completely nailed so many things I love: a modern bohemian indoor/outdoor space filled with lots of plants, layers of patterns, textures and colors, and an eclectic mix of furniture and accessory styles including modern, vintage inspired, and worldly. There was even a bar area everyone beelined to—because clearly the design team knows I love a good party! And the most amazing part? Everything in the room came straight from Overstock! To be honest, though I know that Overstock was a great resource for finding great deals on lots of home goods as well as major furniture pieces, until I saw this “dream house” I truly didn’t know the extent of the kind of goodies I could shop on the site! From an agate wood credenza to the tassel rug, there were some seriously special pieces. 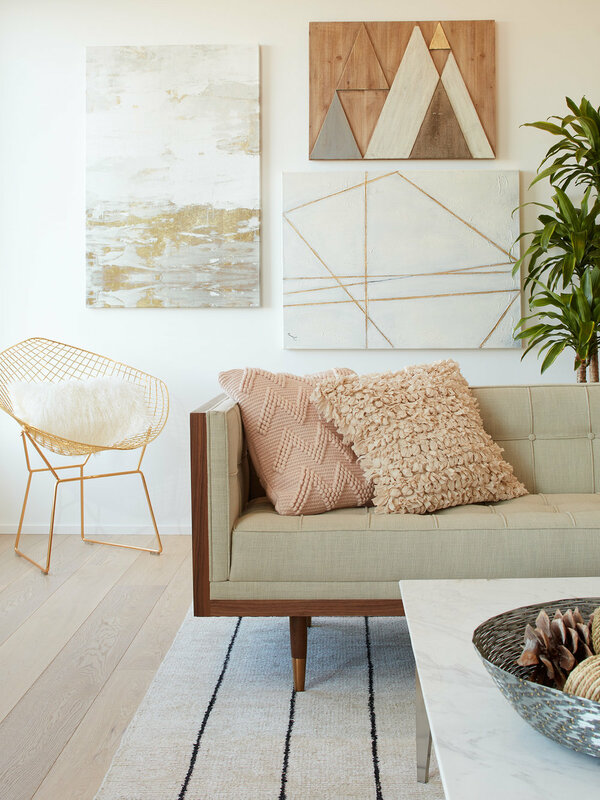 I love all the wood paneling mixed with the gold elements like this floor lamp, coffee table, and arch wall mirror. Some of which came from Worldstock, Overstock’s fair-trade store, which offers handmade pieces sourced from artisans all over the world. Given my love for a modern bohemian vibe, I can totally see myself shopping this section over and over. The artworks were on point, too, like this simple circles piece. Also love this striped blue handmade footstool. Now, let’s go check the other rooms. This living room when you first enter the home is inspired by Cassandra (Coco Kelley). It’s so bright and airy. The dining room was styled impeccably for Kirsten (Simply Grove). Love the blue rug and balanced with all the warm wood and leather tones. This serene bedroom and that breathtaking view captures Jenny’s (Little Green Notebook) vibe so perfectly. And that master bathroom is to LIVE for! Ashley’s (At Home With Ashley) breakfast nook was styled perfectly, too. For more photos of the home and all the sources, go here. Special thanks to the Overstock team who knocked it out of the ballpark! The whole dream home setup has me already thinking about redoing a few rooms in my home with pieces I can find on Overstock. And now, they are making that so much easier with an Augmented Reality feature in the Overstock iOS app. Shoppers can see what certain products would look like next to pieces they already have (or start from scratch in a blank room), to be sure it makes sense in their space before they buy. I think a lot of people—myself included—can often be intimidated to make big home purchases online just because it can be hard to visualize how it’s going to look, and this technology solves that problem completely. I’m definitely using this tool for future projects!